Its time to give back to our much needed ANIMAL community. Since they can’t ask - We are asking for them! We need a brand new home! To save more innocent souls from death sentences..
We have found a piece of land, for our beautiful sanctuary and allot of us will be provided a second, third, or fourth chance, as you know allot of us are held up in the pounds, abandoned, and abused, some of us, plan out dont have anywhere to go, or just need a little TLC before we can go back into the wild. There are allot of lovely rescues that try and help us, but they are getting very full! We want to make sure all our friends have a chance! And if you help us, we can save over 200+ more lives per year! We have everything in place ready to build & provide our friends with the best care possible! & provide a comfortable, loving home till we find OUR own FOREVER AFTER. You will be our sponsors of our Sanctuary, and you will be apart of something amazing AND YOU WILL BE ABLE TO WATCH THE WHOLE JOURNEY UNFOLD! All Our Other Animals Supports World Wide, PLEASE JOIN IN! SUPPORT! So I am sure we can reach our goal IF WE ALL WORK TOGETHER TO CREATE SOMETHING AMAZING! WE CAN’T START THIS PROJECT WITHOUT YOUR HELP! SHARE WORLDWIDE! Which is less than 1% of the world population !!! So help us achieve this, $2 is nothing to you, and everything to the animals that will be saved! We want to think ahead, and make sure all animals are 100% provided for with your $2 a year sponsorship! This is a great way to give back, and constantly be supporting a AU Wide Animal Support Organisation. $2.00 a year, will not prevent you to donating to other shelters or charities throughout the year, we encourage that - but if we can secure $2 a year from at least 645K sponsors then we will have our yearly needs to support ALL these animals! And have the funds to create this sanctuary! So Quickly Go Donate Your $2 Now For Your First Year <3 Thank you !!! We hope to work alone allot of other shelters that need assistance etc - lets all work together !! It might be a short road, it might be a long road, but we will keep going till we reach our target!!! We look forward to doing this journey with you! 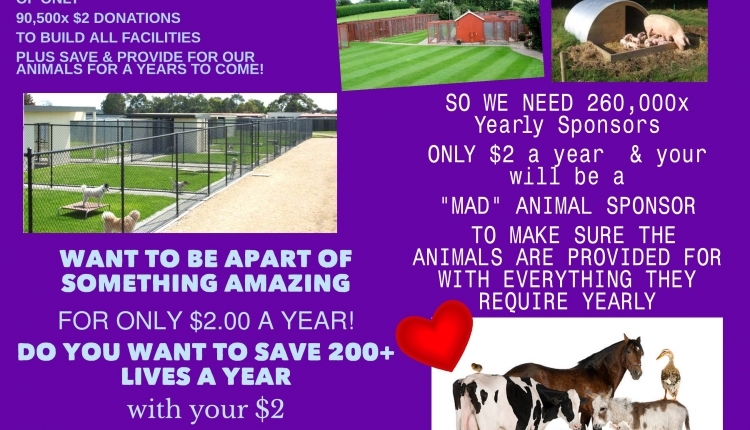 All Hearts Animals Australia will be conducting all our Marketing until our Sanctuary is Completed for ALL to see! Love the support Thank you!!! NEW PERMANENT SECURE ANIMAL SANCTUARY TO HELP SAVE OVER 200 LIVERS PER YEAR. TO BE BUILT, & PROVIDED FOR OTHER RESCUES AS A SISTER CHARITY/SUPPORT TO SAVE MORE LIVES AU WIDE. TO OUR ORGANISATION TO THRIVE & BE SUCCESSFUL! The WANT TO SAVE 200 ANIMAL LIVES A YEAR WITH ONLY $2 petition to allheartsanimalsau@gmail.com was written by All Hearts Animals and is in the category Animal Welfare at GoPetition.